Kharag gro-Shurkul is an Orc lumberjack who works for Hjorunn at the Solitude Sawmill. He will sell lumberHF to you if Hearthfire is installed. He cooks at the sawmill house from midnight to 1am, then heads to the sawmill for work. At 8am, he goes home to cook for an hour, then resumes his work outside until 4pm. He spends the rest of the afternoon at the house, either sleeping, having a meal, or relaxing. Kharag wears a belted tunic and a pair of boots. He wields an iron dagger and carries his key to the mill along with the key to his room. Kharag will greet you quite bluntly, asking you a simple question: "What do you want?" 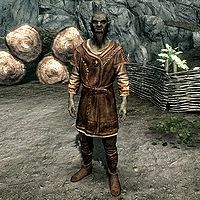 He will then tell you why he enjoys working for Hjorunn: "Out here at work, Hjorunn treats me like an equal. Better than most in town." He will then elaborate on his dislike of going to town: "Any day is a good one, long as I don't have to go into town. But some days, Hjorunn's too drunk..." If Hjorunn is dead, he will instead say, "Any day is a good one, long as I don't have to go into town. But with Hjorunn gone..."
Hjorunn: "Kharag, take a break and drink with me! Those trees aren't going anywhere!" OR "Why so glum, my ugly friend? Did we run out of mead?" Kharag: "I have to work twice as hard because you drink up all our profits." OR "Can you pay attention to work for once, instead of your mug?" Hjorunn: "What did you say? I ought to break off one of those tusks and use it as my drinking horn!" OR "Don't make me to defend the honor of my mead! It's been my friend a lot longer than you have!" Kharag: "Hjorunn, the last time you tried anything, your fist broke on my head!" OR "Just as long as you don't breathe on me, Hjorunn. I'll be out for hours." Hjorunn: "Guess we can't afford to miss that much work, can we? Oh well..." OR "True enough, you cur. Back to work, I suppose..."
Kharag will refer to Hjorunn as dead even if he isn't. This page was last modified on 11 May 2018, at 19:21.